Yucatán (Spanish pronunciation: [ɟ͡ʝukaˈtan] ( listen)), officially the Free and Sovereign State of Yucatán (Spanish: Estado Libre y Soberano de Yucatán), is one of the 31 states which, with Mexico City, comprise the 32 Federal Entities of Mexico. It is divided into 106 municipalities, and its capital city is Mérida. Before the arrival of Spaniards to the Yucatán Peninsula, the name of this region was Mayab. In the Mayan language, "ma' ya'ab" is translated as "a few". It was a very important region for the Mayan civilization, which reached the peak of its development here, where the Mayans founded the cities of Chichen Itza, Izamal, Motul, Mayapan, Ek' Balam and Ichcaanzihóo (also called T'ho), now Mérida. After the Spanish conquest of Yucatán, the Peninsula was a single administrative and political entity, the Captaincy General of Yucatán. Following independence and the breakup of the Mexican Empire in 1823, the first Republic of Yucatán was proclaimed, which was then voluntarily annexed to the Federal Republic of United Mexican States on December 21, 1823. On March 16, 1841, as a result of cultural and political conflicts around the federal pact, Yucatán declared its independence from Mexico. forming a second Republic of Yucatán. Eventually on July 14, 1848, Yucatán was forced to rejoin Mexico. In 1858, in the middle of the caste war, the state of Yucatán was divided for the first time, establishing Campeche as a separate state (officially in 1863). During the Porfiriato, in 1902, the state of Yucatán was divided again to form the Federal territory that later became the present state of Quintana Roo. Today, Yucatán is the safest state in Mexico and Mérida was awarded City of Peace in 2011.
because talking with those Indians of the coast, whatever the Spanish asked the Indians responded: Tectetán, Tectetán which means I don't understand you, I don't understand you; they corrupted the word, and not understanding what the Indians said, they said: Yucatán is the name of this land; and the same happened in a place, a cape, which they also called Cape Cotoch; and Cotoch in that language means house. The second proposed explanation comes from Bernal Díaz del Castillo. 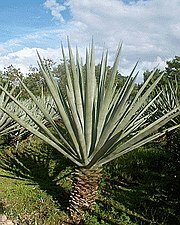 In his book Historia verdadera de la conquista de la Nueva España (True History of the Conquest of New Spain), he says Yucatá means "land of yucas", a plant that was cultivated by the Maya and was an important food source for them. The third, and most likely, explanation is that the name derived from the Maya people who inhabited the region. Today the people are referred to by their Aztec name, the Chontal, but the Chontal Maya people refer to themselves as the Yokot'anob or the Yokot'an, meaning "the speakers of Yoko ochoco". 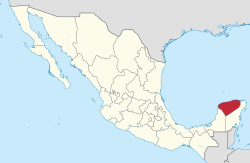 Thus Yucatan most likely derives from Yokot'an. The origin of the first settlements has not been scientifically confirmed, although the presence of first humans in the area dates from the late Pleistocene or ice age (about 10,000–12,000 years), according to the findings in the Loltún caves and caverns of Tulum (Women of the Palms). The first Maya moved to the Peninsula circa 250 CE, from the Petén (today northern Guatemala), to settle the southeastern peninsula in the modern Bacalar, Quintana Roo. In 525, the Chanés (Mayan tribe that preceded the Itza), moved to the east of the peninsula, founding Chichén Itzá, Izamal, Motul, Ek' Balam, Ichcaanzihó (modern Mérida) and Champotón. Later, Tutul xiúes, Toltec descent, who came from the coast of the Gulf of Mexico, settled in the region causing displacement of the Itza and Cocomes—a diversified branch of Itzá—and finally, after years and many battles, was formed Mayapán League (composed of the Itza, the Xiús and Cocomes), that eventually disintegrated circa 1194, giving way to a period of anarchy and fragmentation into small domains which the Spanish conquistadors found in the 16th century. In 1513, Juan Ponce de León had already conquered the island of Borinquén (now Puerto Rico) and had discovered Florida. Antón de Alaminos, who was with Ponce de León on this latest discovery, suspected that west of Cuba they could find new land. Under their influence, Diego Velázquez de Cuéllar, supported by the governor of Cuba, organized an expedition commanded by Francisco Hernández de Córdoba to explore the seas west of the island. This expedition sailed from port of Ajaruco on February 8, 1517, to La Habana and after circling the island and sailing southwest by what is now known as the Yucatán Channel, the expedition made landfall at the Yucatán Peninsula on March 1. There are discrepancies about where the first explorers arrived. Some say it was in Isla Mujeres. Bernal Díaz del Castillo places it at Cabo Catoche where they saw a great city which they named the «Gran Cairo». The conquest of Yucatán was completed two decades after the conquest of Mexico; by Francisco de Montejo "el Adelantado", his son Francisco de Montejo y León "el Mozo" and his nephew, Francisco de Montejo "el Sobrino". El Adelantado was in the expedition of Juan de Grijalva and was with Hernán Cortés in the third expedition that eventually became the Conquest of Mexico. He was subsequently appointed for the conquest of the Maya of Yucatán, but failed in his first attempt in 1527–28. In 1529 he was appointed Governor of Tabasco, with the order to pacify Tabasco and conquer Yucatán and Cozumel. El Adelantado was appointed governor of Honduras and then of Chiapas. Therefore, he gave his son "El Mozo", the mission to consummate the conquest of Yucatán. Francisco de Montejo y León "el Mozo" founded the cities of San Francisco de Campeche on October 4, 1540, and Mérida on January 6, 1542 (in honor of Mérida, Extremadura). The city of Mérida was founded over the ruins of the Mayan city of Ichkanzihóo (T'ho) and the stones of old Mayan pyramids were used for the new buildings. Later, government powers were changed from Santa María de la Victoria, Tabasco, to Mérida on June 11, 1542. The newly founded Mérida was besieged by the Mayan troops of Nachi Cocom (overlord or 'Halach uinik' in Mayan language). It was a definitive battle for the Conquest of Yucatán. With that victory, the Spaniards consolidated their control of the western part of the peninsula. On September 15, 1821, in the Hall of Councils of the City of Mérida, Yucatán declares its independence from Spain, almost immediately, Governor Juan María Echeverri sent two representatives to negotiate the incorporation of Yucatán to the Mexican Empire. 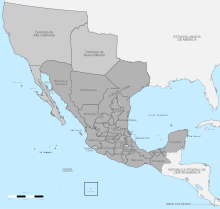 The incorporation to the Mexican Empire was on November 2, 1821. The Mexican Empire was quickly overthrown under the Plan of Casa Mata, the provinces of the empire became independent states. The first Republic of Yucatán, declared on May 29, 1823, joined the Federal Republic of the United Mexican States as the Federated Republic of Yucatán on December 23, 1823. The second Republic of Yucatán[a] emerged when the federal pact signed by Yucatán and endorsed in the Constitution of Yucatán of 1825 was broken by the centralist government of Mexico since 1835. In 1841 the state of Tabasco decreed its separation from Mexico and Miguel Barbachano, then governor of Yucatán, sent a commission headed by Justo Sierra O'Reilly to meet with Tabasco authorities to propose the creation of an independent federal republic from Mexico formed by the two states. The idea failed when Tabasco rejoined Mexico in 1842. On August 22, 1846, Mexican interim president José Mariano Salas restored the 1824 constitution and the federalism. Two years later, during the government of president José Joaquín de Herrera, Miguel Barbachano ordered the reinstatement of Yucatán to Mexico under the Constitution of Yucatán of 1825. A decisive factor for the reinstatement was the Caste War, which forced Yucatán to seek outside help. In 1852 due to internal struggles between opposing political factions, was created the Territory of Campeche. On April 29, 1863, during the government of Benito Juárez, Campeche gained its current status as an independent state. 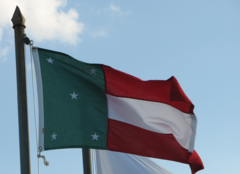 Rodolfo Menéndez de la Peña, historian, describes the flag of Yucatán: "The flag of Yucatán was divided into two parts: green on left, the right, with three divisions, red up and down and white in the middle. In the green field highlighted, five stars, symbolizing the five departments that Yucatan was divided by decree of November 30, 1840: Mérida, Izamal, Valladolid, Tekax and Campeche." The flag doesn't have official recognition in the state, however, it has a strong recognition among the people of the state. De facto state flag, in any case, according to a convention led by former president Ernesto Zedillo, is a white flag with the shield of the state in the middle. Adam Jones wrote: "This ferocious race war featured genocidal atrocities on both sides, with up to 200,000 killed." Because of the conflict, on November 24, 1902, Yucatán had a second territorial division when Porfirio Díaz decreed the creation of the Federal Territory of Quintana Roo, with capital in the port of Payo Obispo (today Chetumal). In little more than half a century, Yucatán lost more than two thirds of its original territory. The incredible influx of wealth during that period from the henequn industry focused mainly on Mérida, the capital of Yucatán State. It allowed the city of Mérida to install street lights and a tram system even before Mexico City. It is said that in the early 20th century, the city had the largest number of millionaires per capita in the world. Today, Paseo de Montejo (inspired by the Parisian avenue Champs-Élysées), is lined with the elegant houses built during that time. These houses are mostly now renovated and serve as everything from private homes to banks, hotels and restaurants. Many of the haciendas today have also been renovated and now serve as private homes, event venues and upscale luxury hotels. In 1905, 1,003 Korean immigrants, which included 802 men and 231 women and children, departed from the port of Chemulpo, Incheon aboard the ship Ilford to Salina Cruz, Oaxaca, Mexico. The journey took 45 days, after which they took a train to Coatzacoalcos, Veracruz. In the Veracruz port, another boat was taken to the port of Progreso with the final destination being the capital city of Mérida, Yucatan. They arrived in May 1905, with previously signed contracts for four years’ work as indentured laborers on the Yucatán henequen haciendas. Many of these Koreans were distributed throughout the Yucatán in 32 henequen haciendas. The town of Motul, Yucatan, located in the heart of the henequen zone, was a destination for many of the Korean immigrants. Subsequently, in 1909, at the end of their contracts, they began a new stage in which they scattered even further. Thus, the majority of those who came were single men who made or remade their family lives with Yucatecan especially Maya women. While Korean girls were much more subject to marriages arranged by Korean parents, males had greater freedom when it came to making a family. This rapid intermarriage by Koreans, coupled with geographic dispersal, prevented the establishment of close social networks among these migrants and therefore provided the basis for Korean descendants among the Yucatan Peninsula. After that 1905 ship, no further entries of Koreans into Mexico were recorded until many years later, leading to a new community of Koreans with completely different characteristics from those who entered in 1905. Poc Chuc, a Mayan/Yucatecan version of barbecued pork. Salbutes and Panuchos. Salbutes are soft, cooked tortillas with lettuce, tomato, turkey, and avocado on top. Panuchos feature fried tortillas filled with black beans and topped with turkey or chicken, lettuce, avocado and pickled onions. Habanero chiles accompany most dishes, either in solid or puréed form, along with fresh limes and corn tortillas. Queso relleno, a "gourmet" dish featuring ground pork inside of a carved Edam cheese ball served with tomato sauce and gravy. Sopa de Lima, a lime-flavored soup with meat (turkey, chicken, or pork), served with tortilla chips. Papadzules, egg tacos covered in pumpkin seed sauce and tomatoes. Cochinita Pibil, a marinated pork dish and by far the most renowned of Yucatecan food. Xcatik, a type of chili. The Yucatán State Police is the law enforcement agency inside the state. The security in the interior of the state was praised multiple times by former president Felipe Calderón Hinojosa, local and foreign businessmen, as well as by governor Ivonne Ortega Pacheco. ^ "La bandera de Yucatán". Diario de Yucatán. Archived from the original on December 24, 2009. Retrieved August 30, 2010. ^ "La historia de la República de Yucatán". Portal Electronico de Dzidzantun Yucatán. Retrieved August 30, 2010. ^ a b "Las Diputaciones Provinciales" (PDF) (in Spanish). p. 15. ^ Nettie Lee Benson; Colegio de México. Centro de Estudios Históricos; Universidad Nacional Autónoma de México (1994). La diputación provincial y el federalismo mexicano. UNAM. pp. 227–. ISBN 978-968-12-0586-7. Retrieved February 20, 2011. ^ "Senadores por Yucatán LXIV y LXV Legislatura". Senado de la República. Retrieved March 24, 2019. ^ "Listado de Diputados por Grupo Parlamentario del Estado de Yucatán". Cámara de Diputados. Retrieved March 24, 2019. ^ "Resumen". Cuentame INEGI. Archived from the original on April 19, 2013. Retrieved February 12, 2013. ^ "Relieve". Cuentame INEGI. Archived from the original on July 23, 2011. Retrieved October 20, 2010. ^ "Mexico en Cifras". INEGI. Archived from the original on April 20, 2011. Retrieved April 9, 2011. ^ "Reporte: Jueves 3 de Junio del 2010. Cierre del peso mexicano". pesomexicano.com.mx. Retrieved August 10, 2010. ^ "Yucatán, el Estado más seguro del país". Punto Medio. Archived from the original on August 16, 2010. Retrieved April 10, 2010. ^ "Confirman a Yucatán como estado más seguro". Grupo Sipse. Archived from the original on October 8, 2011. Retrieved April 10, 2010. ^ "Declararán a Mérida ciudad de la paz". Vanguardia. Retrieved April 10, 2010. ^ "Aprovecha Mérida nombramiento de 'Ciudad de la Paz' para atraer inversiones". Diario de Yucatán. Retrieved April 10, 2010. ^ "¿Cómo se alimentaban los mayas?". Retrieved May 4, 2010. ^ Diario de Yucatán (January 2001). "La Ruta Puuc". Archived from the original on March 30, 2010. Retrieved May 4, 2010. ^ Peck, Douglas T. "Misconceptions and Myths Related to the Fountain of Youth and Juan Ponce de Leon's 1513 Exploration Voyage" (PDF). New World Explorers, Inc. Archived from the original (PDF) on April 9, 2008. Retrieved May 5, 2010. ^ "Datos de Interes" (in Spanish). ^ "La Historia de la República de Yucatán" (in Spanish). ^ "SEP" (in Spanish). Archived from the original on October 26, 2011. ^ Diario de Yucatán. "160 aniversario de la Bandera de Yucatán". Archived from the original on February 25, 2010. Retrieved August 10, 2010. ^ Gobierno del Estado de Quintana Roo. "Historia". Archived from the original on May 29, 2010. Retrieved August 28, 2010. ^ Fields, Ellen. "Haciendas of the Yucatan". Yucatan Living. Archived from the original on May 6, 2015. Retrieved May 11, 2015. ^ Instituto Nacional de Estadística y Geografía (2008). "Perfil sociodemográfico de Yucatán" (PDF). p. 8. Retrieved September 19, 2010. ^ "Mexico: extended population list". GeoHive. Archived from the original on March 11, 2012. Retrieved July 29, 2011. ^ "Encuesta Intercensal 2015" (PDF). INEGI. Retrieved December 9, 2015. ^ a b Novelo, Victoria (2009). Yucatecos en Cuba: Etnografía de una migración,. Yucatan,Mexico: CIESAS/Conaculta/Instituto de Cultura de Yucatán/La Casa Chata, Serie Antropológicas. ^ Dávila Valdés, Claudia (2015). "Socio-Economic Trajectory and Geographical Mobility of Lebanese and Koreans: From Motul to Mérida". Migraciones Internacionales. Retrieved June 13, 2016. ^ Hyong-Ju, Kim (2003). "La experiencia migratoria de la nueva comunidad coreana en México". Second Meeting on Korean Studies in Latin America, Centro de Estudios de Asia y África, Korea Foundation/Colmex/UBA. ^ "Misión" (in Spanish). Retrieved July 14, 2015. ^ Diario de Yucatán (May 21, 2011). "Resalta el presidente Calderón la seguridad en Yucatán". Archived from the original on June 15, 2011. Retrieved June 9, 2011. ^ La Revista Peninsular. "Elogian empresarios seguridad de Yucatán". Archived from the original on November 27, 2011. Retrieved June 9, 2011. ^ Organización Editorial Mexicana (May 5, 2011). "Yucatán, el estado más seguro: Ivonne Ortega". Retrieved June 9, 2011. ^ puntomedio.com.mx (September 17, 2010). "Cultura, deporte y seguridad, pilares del gobierno de Ivonne Ortega". Archived from the original on November 26, 2011. Retrieved June 9, 2011. ^ El Universal (October 28, 2011). "Resalta Ivonne Ortega seguridad en Yucatán". Retrieved November 28, 2011. Wikimedia Commons has media related to Yucatán. Wikisource has the text of the 1911 Encyclopædia Britannica article Yucatan. Wikivoyage has a travel guide for Yucatán.